Alkaline Regulator™ adjusts pH to the alkaline range (7.1–7.6) and supports the establishment of the optimal environment for all alkaline acclimated species (e.g. bosemani, various other rainbows etc.). For further freshwater environment enhancement, use Fresh Trace™ to restore the proper level of trace elements and feed NutriDiet® Tropical Flakes for thriving, healthy freshwater community fish. Contains phosphate buffers and conditioning agents. 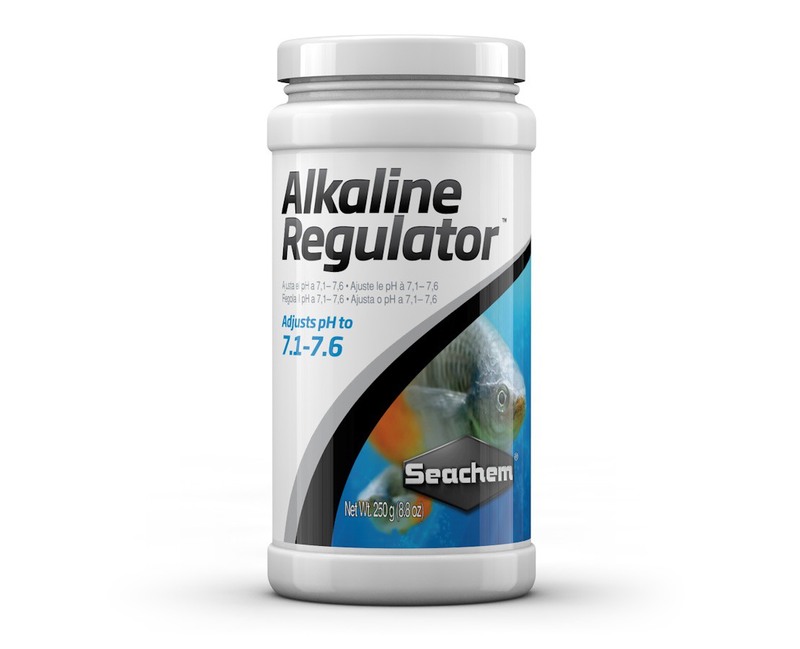 Safe for all freshwater fish acclimated to alkaline pH. Use 1 level teaspoon (5 g) for every 40–80 L (10–20 US gallons) daily until intended pH is reached. Thereafter, use once a month or with water changes as required to maintain pH. To lower pH, use Neutral Regulator®. What is the difference between Alkaline Regulator™ and Alkaline Buffer™? A: The difference is that Alkaline Buffer™ is a carbonate/bicarbonate based buffer and Alkaline Regulator™ is a phosphate based buffer. High phosphate levels can promote algae growth so it is often a better choice to use a phosphate free buffer like Alkaline Buffer™. The only drawback to a non-phosphate buffer is that there tends to be more pH fluctuation owing to CO2 equilibrium. Phosphate buffers lock the pH in quite well and hold it there. I try to keep my water between 6.8 and 7.2 pH so I'm not aiming for a perfect 7.0. Why wouldn't I use your Neutral Regulator™ instead of your alkaline products? A: You certainly can use Neutral Regulator™ if you're trying to get to around 7. Alkaline Buffer™ and Alkaline Regulator™ are indicated for use if you are trying to get a pH above 7.